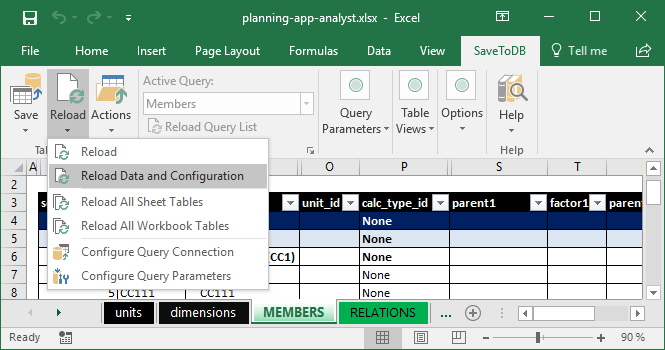 This e-book shows how to configure a planning application built with Microsoft Excel and SQL Server. You may download the source codes, install the application into your database, and repeat all the steps. 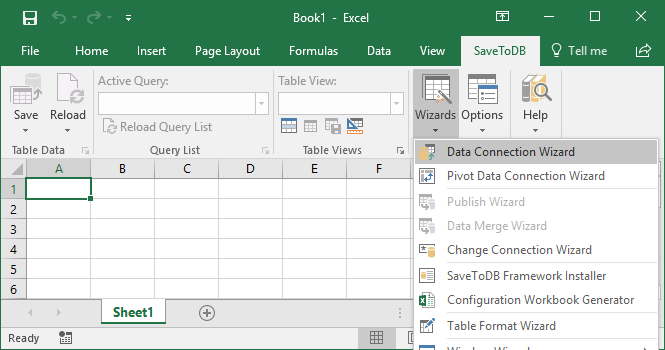 If your company uses Microsoft Excel to get and share business data, you may save a lot of time and money. If your company uses Microsoft Excel to get and share business data, you have to continue reading. You may get great benefits and save a lot of time and money. 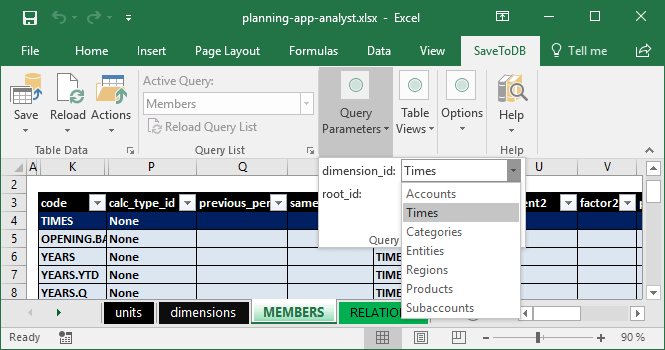 The application uses the SaveToDB Enterprise add-in for Microsoft Excel to work with SQL Server. You may download the trial version of the SaveToDB add-in and the source code of the planning application to install it in your environment. 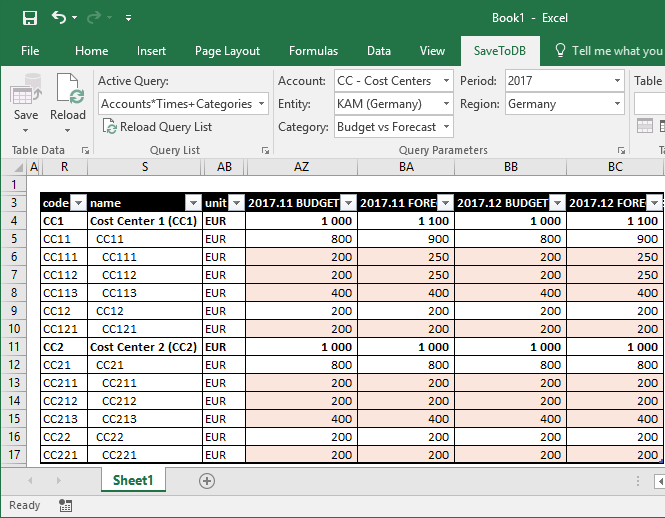 Import budget and actual data. 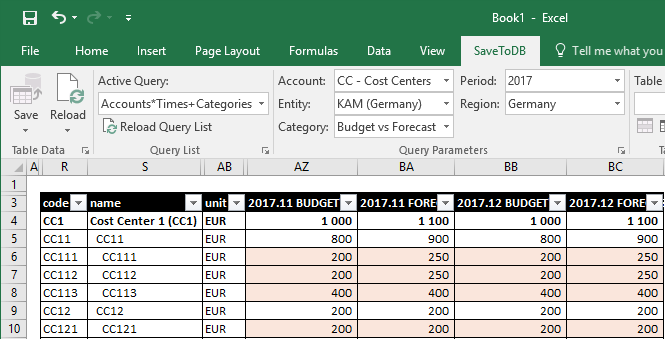 Copy budget and actual data to forecast. I hope you will enjoy reading and become a fan. We will configure the application for the following business case. A company has a budget for the current year in a Microsoft Excel workbook. 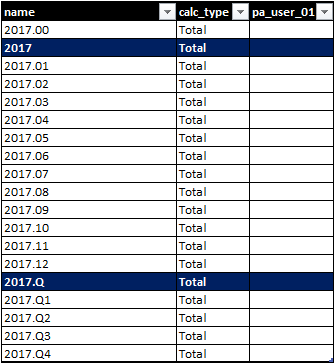 The company has actual data for January - October in an accounting system. CFO needs an updated cost forecast for November - December and the entire year. CFO wants to see detailed and consolidated data, actuals versus forecast and budget versus forecast. The company has three cost centers with hierarchical structures. The company operates in Germany, Austria, Switzerland, and France. The company has four key account managers (KAM) responsible for each country. The table contains Budget vs. Actual for January - October, and Budget vs. Forecast for November - December. Key account managers must have the possibility to see the budget and actual data by countries in a read-only mode and edit forecast data for November - December. This example is based on the model created by MultiBase GmbH (www.multibase.de). MultiBase GmbH has a great team of experts in reporting and analytics, ETL, and database management. I appreciate the permission to use their model. We may define the following model to implement business case requirements. At this time we would combine the Entities and Countries dimensions. However, these are different business entities. So, we have two dimensions to have the possibility to extend the model in the future. 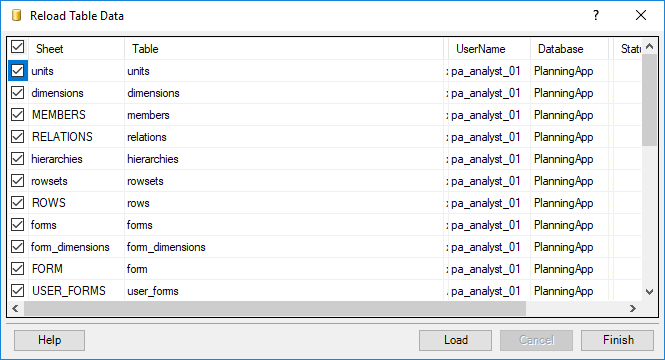 We will use the planning-app-analyst.xlsx workbook from the downloaded package to configure the application. Open the workbook and change connections to your database first. The application uses USD as the base currency (id 0). We need to change it to EURO. Right-click on EUR and execute "Set as the base currency." You may add other currencies and units later. Set is_currency = 1 for currencies. Set is_base_currency = 1 for base currencies (the first currency in pairs like EUR/USD). Do not forget to click the Save button on the SaveToDB tab to save changes. The application has seven dimensions. The first four are mandatory. Dimension 5-7 are optional. You may change codes, names, and other parameters. However, do not change id values. Also, do not change the meaning of the Accounts, Times, Categories, and Entities dimensions. In this step, let&apos;s activate the Regions dimension and click the Save button to save the changes. The table contains several parameters related to permissions. We will configure this later. The Accounts dimension contains a single member at the beginning. First of all, we have added the root member for our reports, CC - Cost Centers. 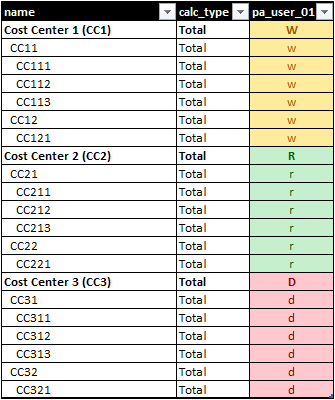 Also, we have added items to the first cost center only (we will use these rows for other centers as templates). We have filled the sort_order, code, and name columns. The code field values must be unique. The application uses sort_order values to sort members. Click the Save button to save new members. 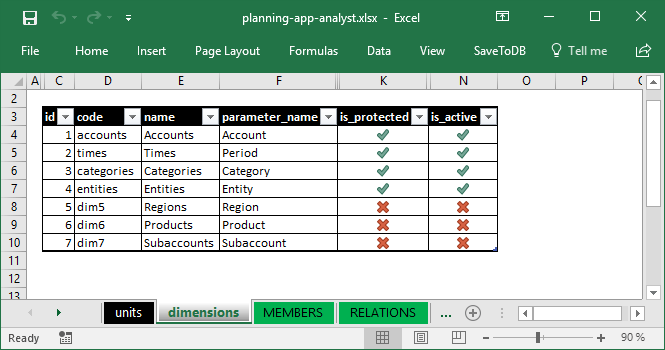 The application outputs these values into hidden columns of forms and reports. 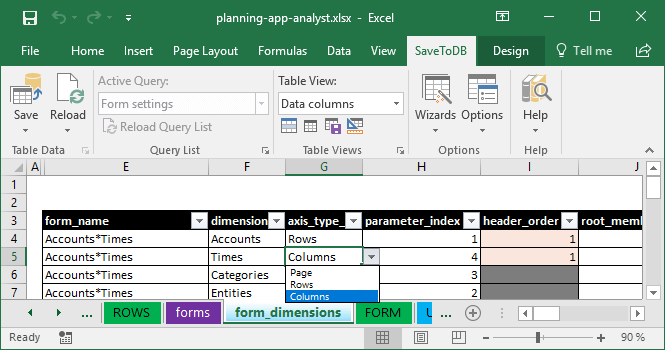 The forms use standard Excel conditional formatting to format rows, columns, and cells. Use Reload Data and Configuration whenever you need to update lists or parameters. 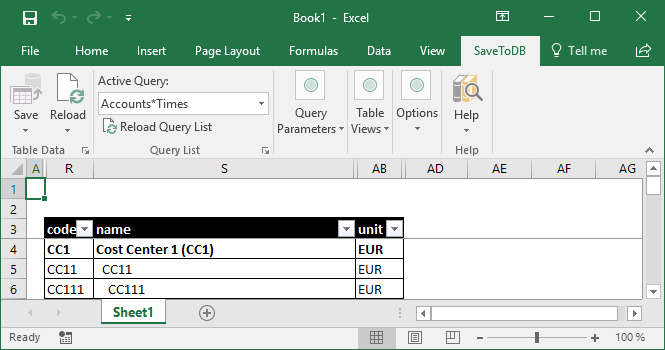 You may select values from drop-down lists or just copy and paste values. 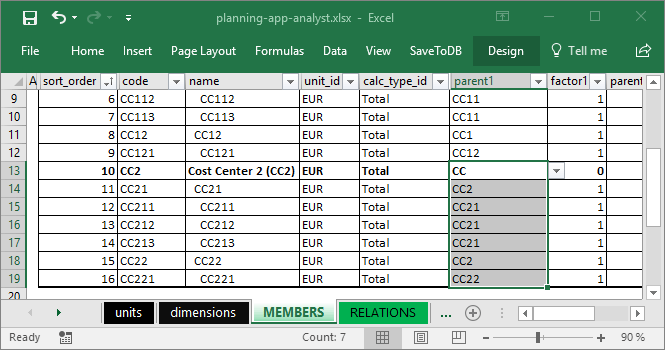 In this example, we assign EURO and the Total calculation type to all members. You may use any value later. Take a look at the parents and factors. These values are used to calculate aggregates and to create hierarchies. The example has simple rules for members like CC11 or CC111. We also need to set parents for upper-level members like CC with factor 0 to create hierarchies. Click Save to save changes and then click Actions, Update hierarchies to update required rules for new members. Do not forget to update hierarchies after changes in members. Try this first if you have any issue with members. Now we will add members for cost centers 2 and 3 using a trick. You may use this trick with the SaveToDB add-in anywhere. Click Save and then Reload Data and Configuration to update validation lists in the parent columns. Click Save and then click Actions, Update hierarchies. Now you may repeat the steps to the cost center 3. 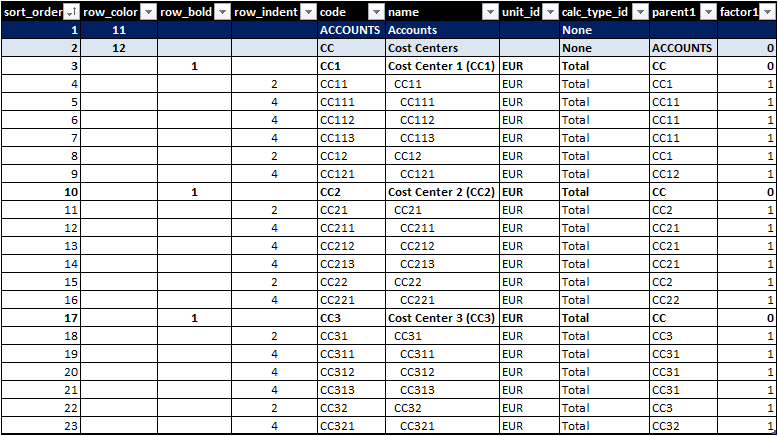 Just copy rows of the cost center 2, change sort orders and replace CC2 to CC3. This view shows columns related to the Times dimension and hides others. You may use this feature on other worksheets also. Moreover, you may create your personal views. Just click the Save Table View button in the Table Views group. The screenshots above have a compacted ribbon. The application adds the complete set of configured members to get data for months, YTD, quarters, and years. Use members like 2017.00 to input opening balance values in your applications. We do not use it in this example. 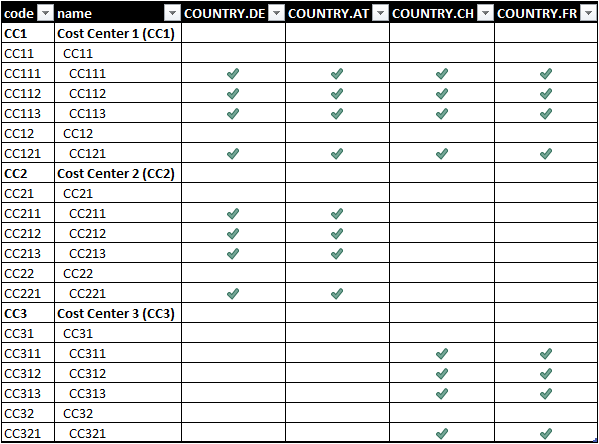 Select the Categories in the dimension_id parameter at the ribbon and apply the Categories table view. The dimension contains three basic members that contain data: Budget, Forecast, and Actual. The Same Period is a special member that shows actual data for the same period of the previous year. Also, the dimension contains several calculated members that show differences in comparison reports. You may add and configure additional members in your applications (for example, for different versions). In this example, we will use the predefined members. Select the Entities in the dimension_id parameter at the ribbon and apply the Entities table view. 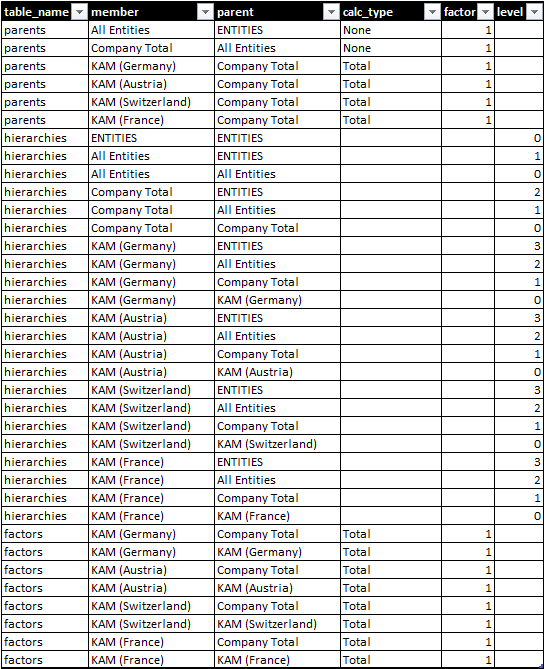 We have used the existing member TOTAL as a parent instead of creating a new member All KAMs. We may create it later if we need a separate aggregate for it. Do not forget to update hierarchies after saving changes. In this case, we have created a separate member, All Countries, to get totals. Do not forget to save the changes and to update hierarchies. You may check generated application rules in the hierarchies worksheet. You may see source parents from the MEMBERS worksheet, created hierarchies, and calculation factors. The application uses these data to filter members by parents and hierarchy levels and to calculate aggregates. You may update rules using the Update hierarchies item in the Actions menu. It helps to show meaningful rows in forms with multiple dimensions in rows. 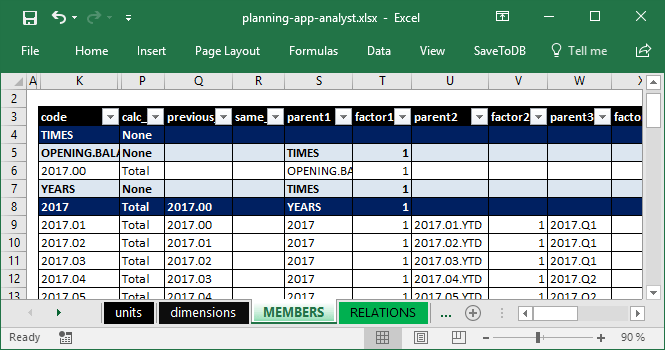 To edit member relations open the RELATIONS worksheet. 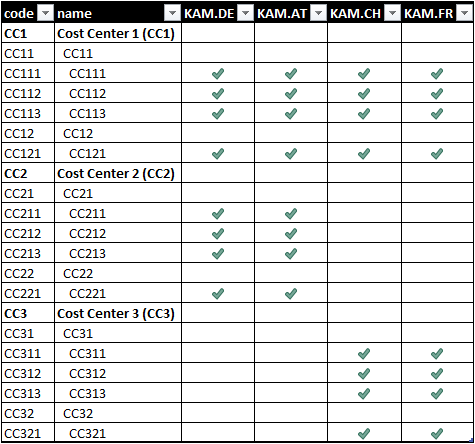 In this example, all managers may input data for the cost center 1, only managers from Germany and Austria may input data for the cost center 2, and only managers from Switzerland and France may work with the cost center 3. Note that these are not permissions. These are business rules. That means that the company does not have cost center 2 operations in Switzerland and France, and cost center 3 operations in Germany and Austria. To set the relation, type 1. To clear the relation, delete the value. You may copy and paste values. The application changes the configuration immediately after the change. You do not need to click the Save button. In this example, the tables are similar. In this chapter, we will discuss configuring forms for business users. 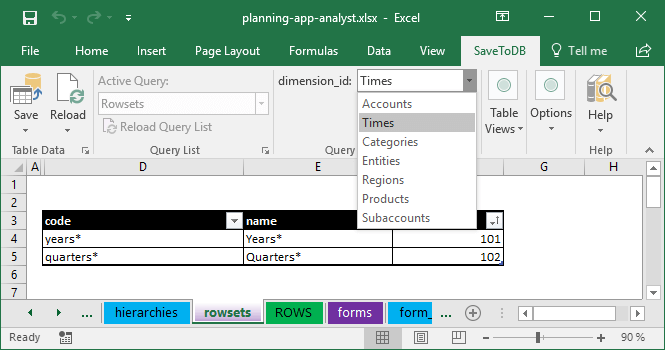 Business users have personal Excel workbooks to work with forms. We will open an example later. 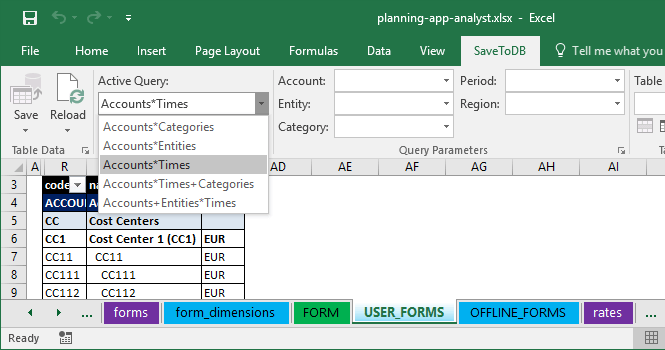 Business analysts may test forms on the USER_FORMS and OFFLINE_FORMS worksheets. 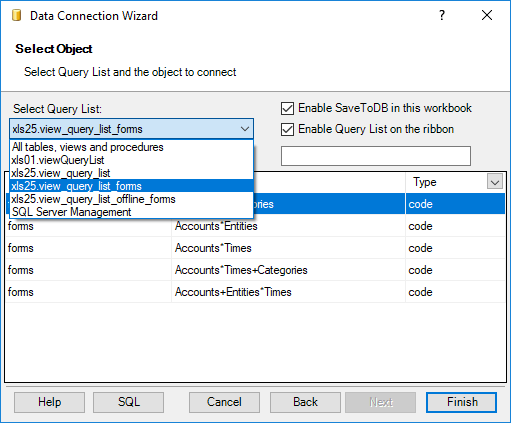 The Active Query list is dynamic and contains preconfigured active forms with the actual select permission. So, different business users may have different lists. We may see accounts in form rows and time periods in columns. 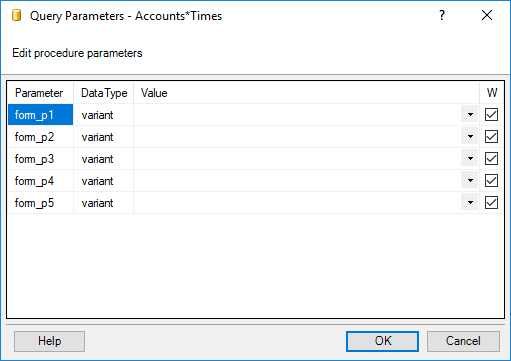 This is a preconfigured layout for the Accounts*Times form. You may configure layouts with the desired row and column dimensions. 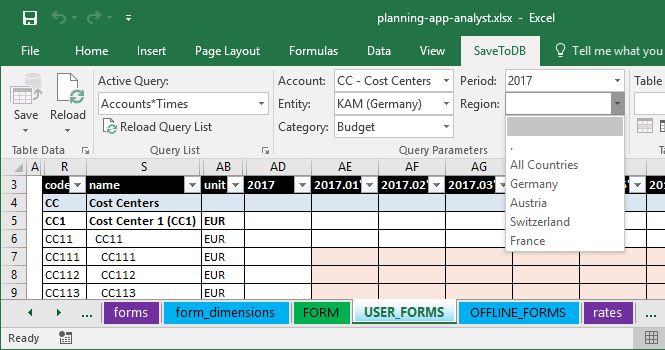 All application forms use standard Excel formatting features. You may change rules including fonts, colors, sizes, borders, and number formats. Check the forms you want to save and click Save in Database. 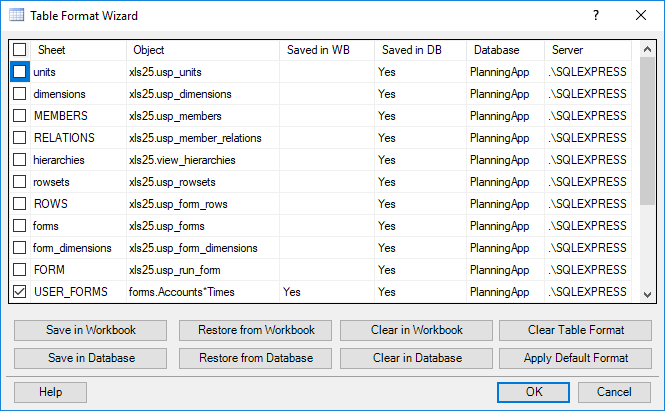 Note that you and other users may also restore formats from a database using the Restore from Database button. The application updates the source cube data immediately after changes, however, it leaves the form as is. You may paste values using formulas. However, the application replaces formulas with values later. Note that you may use Undo (Ctrl-Z) to revert changes. As you may see, the application updates the aggregates. The application controls business logic rules and permissions and may reject user&apos;s changes. In the previous topic, we have discussed forms that update the underlying database immediately after changes. Also, forms control user values using business rules and permissions. However, sometimes we need the possibility to work outside of the corporate network. In this case, we may use offline forms. 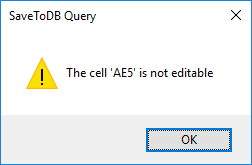 Just load the required data and edit it. Later, you may click the Save button to save the changes. This is a useful scenario. However, note that the form ignores the most of the business rules during editing. For example, you edit data offline. CFO has closed the period for changes. When you click Save, the application will not save your data into closed periods. Note that you have to use SaveToDB 7.13 or higher to work with offline forms. You may distribute application workbooks to end users with any variant or even for both. 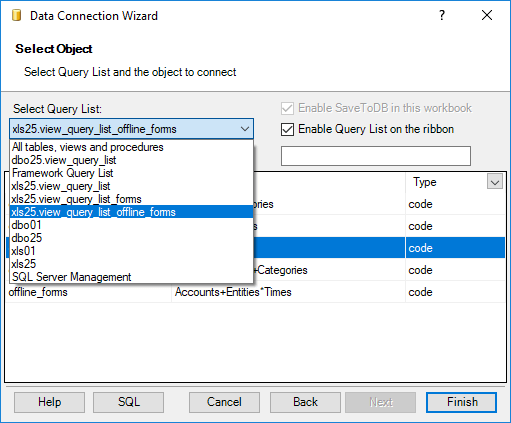 Business users may change query lists quickly using the Query List group button that opens the same dialog box. An additional ASP.NET application allows getting and editing data online on desktops, tablets, and smartphones. 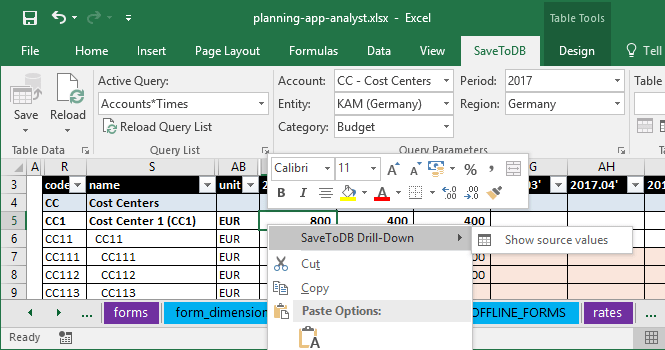 The web application uses the same settings as the Excel application with the SaveToDB add-in, except the conditional formatting. You may customize formatting using CSS styles. We have discussed working with forms above. Below we will discuss configuring forms. As a business analyst, you may create and configure as many forms as your company need. Each form must have a unique code and name. You may change form names anytime. However, try to define form codes correctly before activating. Do not use spaces in codes. Default forms use the * and + signs in the codes and names. This is not necessary but useful. The * sign splits row and column dimensions. The + sign splits dimensions in the same axis. Use friendly codes and names for business forms. For example, CostCenters*Times or just CostCenters. 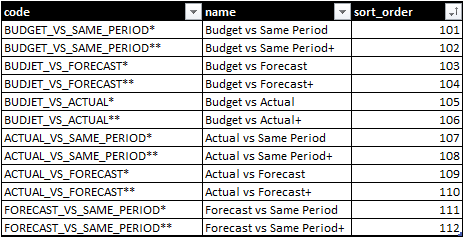 In this example, we need a form to show Budget vs. Actual and Budget vs. Forecast by months. We may use the default Accounts*Times+Categories form for this. We will use the form_dimensions worksheet to configure form layouts and parameters. Use Reload, Reload Data and Configuration to reload validation lists if you add or change dimension members. The form shows only active dimensions. You activate or deactivate dimensions in the dimensions worksheet. 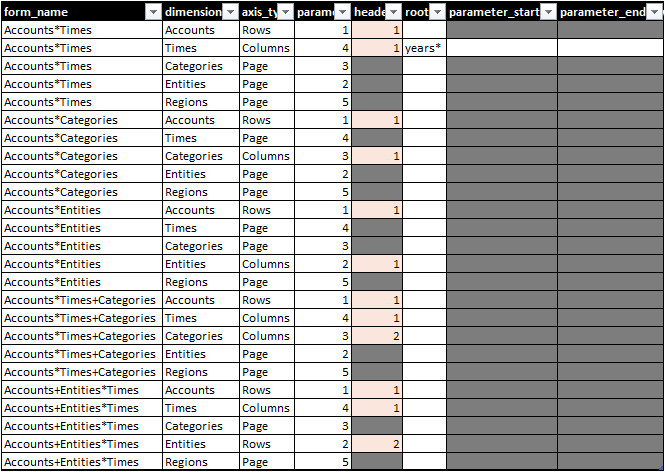 You have to specify the header order for dimensions used in rows and columns. 2017.01 Budget, 2017.01 Actual, 2017.02 Budget, 2017.02 Actual. 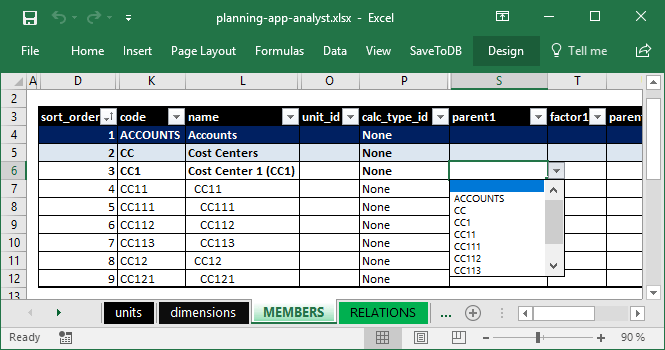 Spaces separate member codes in column headers. That because of you must not use spaces in member codes. 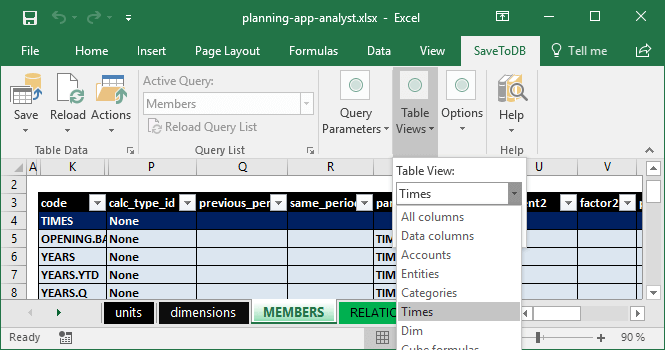 This table view shows columns used to configure form rows. By default, a user may select a parent member for the row axis. The application will include all children. This is a good solution for universal forms. However, if we need to create a specific form with the predefined row set, we may specify the parent directly. In this case, the form would contain only the CC member and its children (see Hierarchies). If we want to exclude the CC member, we may set 1 in the form_start_level column (to exclude level 0). If we want to show children of certain levels only, we may set the end level in the form_end_level column. Another way to configure row sets is using Rowsets. We will discuss this below. However, we specify the row set member in the same field, root_member_id. In this example, we reject the change for the default form. Just click Reload and do not save changes. 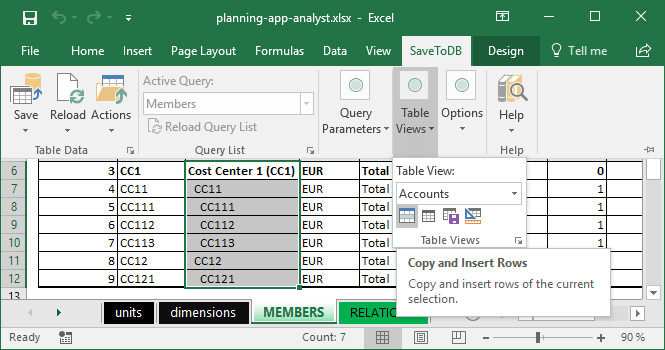 This table view shows columns used to configure form columns. It has the same logic as described above for rows. We dismiss this change in this example. 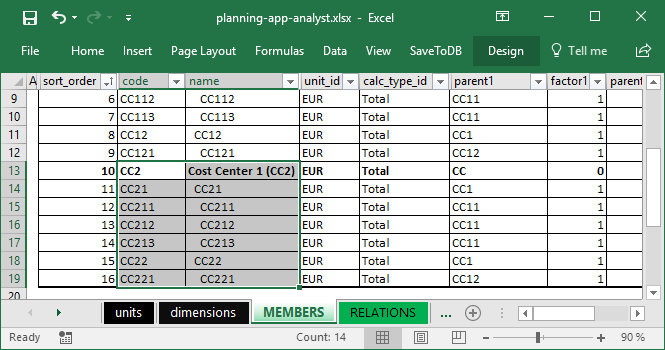 You may configure what parameters in what order to show and what members to use as values. 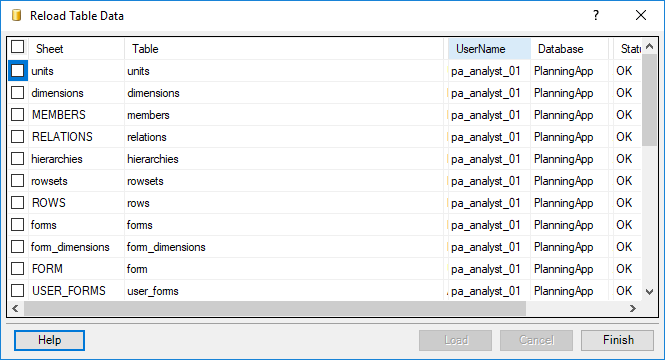 You may reorder parameters using the parameter_index column (shown as param in column 4). Also, you may remove the parameter from the ribbon clearing the parameter_index value. In this case, you must specify the root member (column 6 shows as root). Also, you may change the root member, parameter_start_level, and parameter_end_level to show children of the specified parent with required levels in hierarchies. The example shows using the years* row set as a root member (we dismiss this change). The application shows parameters using business names. You may change these names in the parameter_name field of the dimension configuration discussed above. 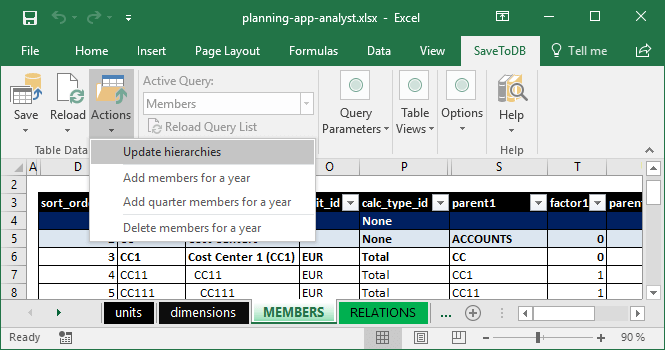 As shown above, by default, the application uses hierarchies to filter members in rows, columns, and parameters. For example, when we select 2017 as a parent, the application includes 2017 and all months of 2017. If we select the YEARS member as a parent, the application includes all year totals and all months. 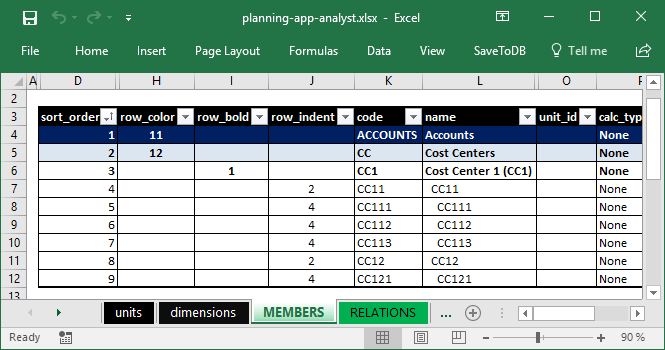 Row sets allow defining sets of members to use in forms. For example, the application contains the built-in years* row set that includes only year totals. 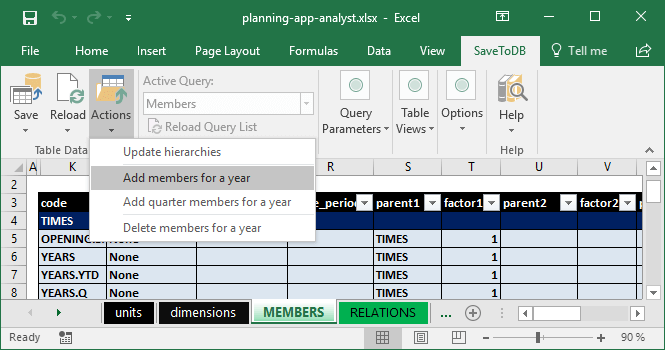 The second reason to use row sets is creating sets of members from different hierarchies. For example, we have parents: Cost Centers, Sales, Cash Flow, and HR. To have a form that uses members from these hierarchies, we may create a set and assign members to its rows. You may see the asterisk at the end of codes and names. This is just a trick used to distinguish hierarchy members and row sets in parameters and validation lists. You may create your rule. The application automatically updates these row sets when you add new time members using the Actions menu. Row sets with one asterisk contain two columns only. For example, Budget and Actual. 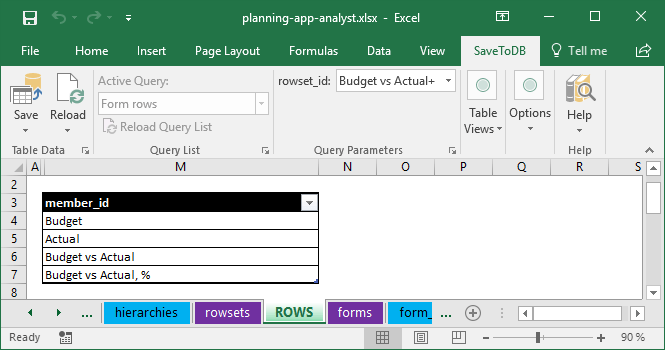 Row sets with two asterisks contain base columns and differences. 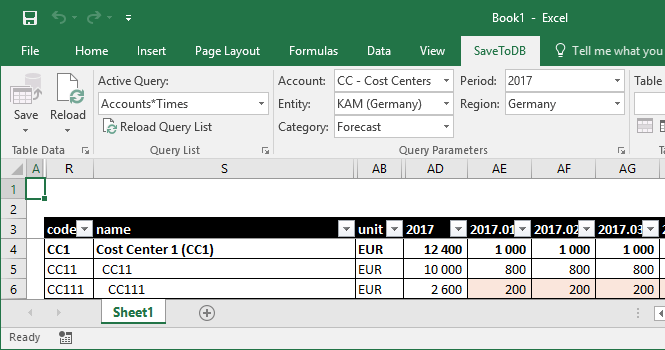 To add a member, copy the line in the desired position using the Copy and Insert Rows in the Table Views group, change the member, and save the changes. You may do even more. You may rewrite any property of the underlying member. For example, you may change row codes, row colors, and indents of form rows. Note that you may add empty lines here (do not add empty members to dimensions). To change row orders, cut and paste lines to the desired position. 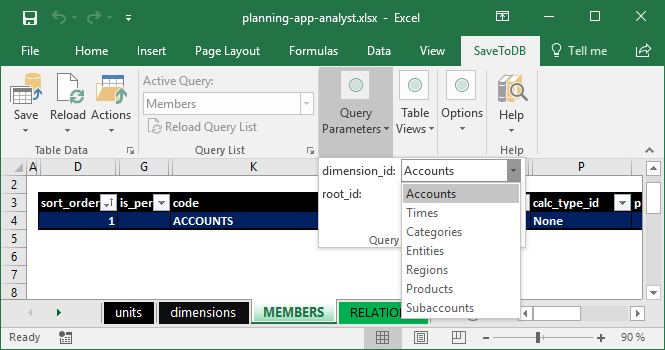 Microsoft Excel tables connect directly to a Microsoft SQL Server database using user credentials. Microsoft SQL Server controls user permissions. So, a database administrator must add application users to a database and assign application roles. Each role has specific predefined permissions for application objects. 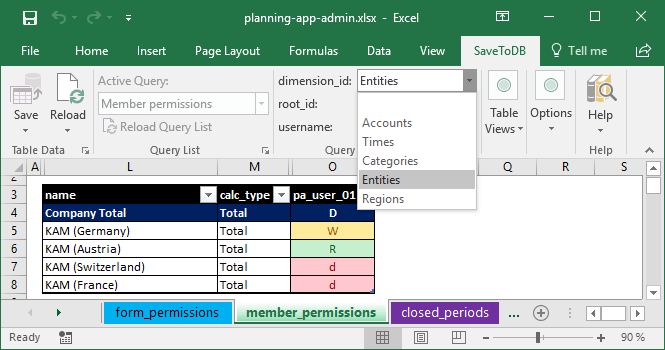 In addition to Microsoft SQL Server permissions, the planning application checks additional internal permissions on the forms and dimension members for business users (members of the planning_app_users role). 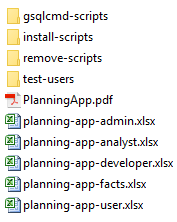 Application administrators manage such permissions using the planning-app-admin.xlsx workbook. It is easy. So, business managers may manage application permissions with no requests to IT. This topic is for database administrators. Create a user in the application database. Assign an application role to the user. planning_app_users, planning_app_analysts, planning_app_administrators, and planning_app_developers. You see a form list configured by business analysts in rows and usernames in columns. Just set 1 to allow executing the form and 0 to deny executing. d - deny, inherited from a parent member. The administrator denies read and write operations for Company Total directly and for its children by inheritance. However, he allows reading and writing for KAM (Germany) and reading for KAM (Austria). As a result, the user may see only two entities and may edit data for the first one only. In this example, we see five active dimensions. The first four are protected. The application checks permissions for these dimensions only. The Times and Categories dimensions allow selecting and updating any member by default. So, you need to deny access to such dimension members if required. The Accounts and Entities dimensions deny access by default. So, you need to allow access for such dimension members. 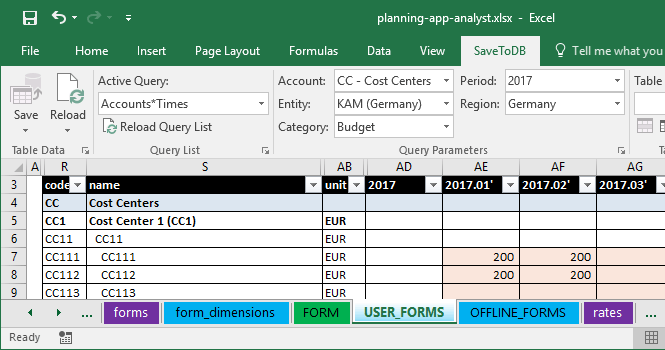 You may find this form in the dimensions worksheet in the planning-app-analyst.xlsx workbook. Typically, you set permissions for upper-level members, and the application applies permissions to child members. You may tune permission for any child member. Just change its permissions. Typically, this is a protected dimension, and you have to allow access directly. Typically, this is a protected dimension that allows reading and writing by default. So, you may leave this as is. 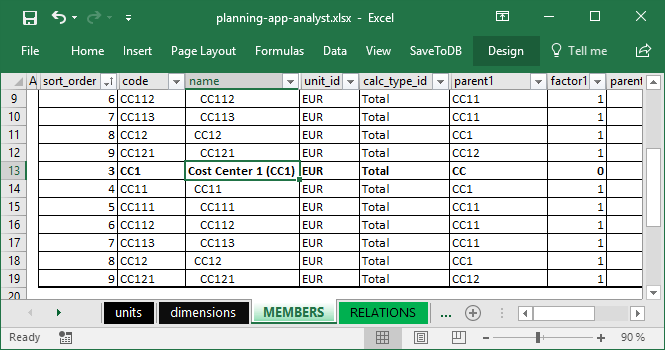 Note that you see dimension members that may contain input data. You do see calculated members. In this example, the region dimension is not protected. So, the application does not control access, and you do not need to change its permissions. For example, in this case, we closed all periods for all categories except the November and December forecast. The application checks these settings for all users including business analysts and application developers. 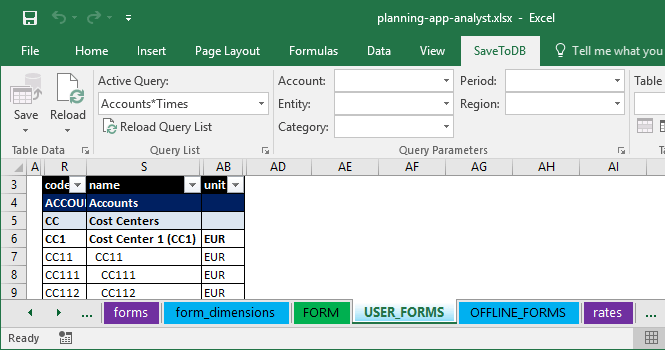 The planning-app-analyst.xlsx workbook also contains this form, and business analysts may close periods too. 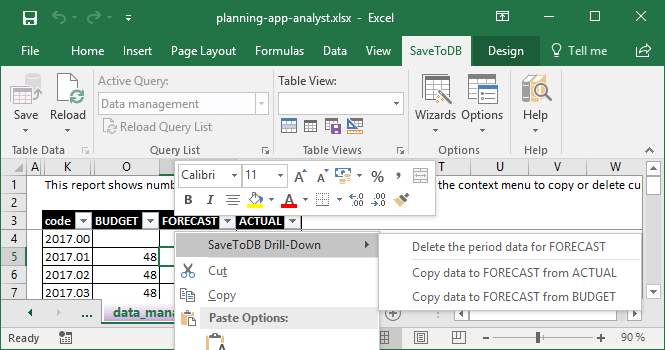 Copy and paste data from existing Excel workbooks. Import data using SQL commands. If you have a lot of data, you may contact us to discuss other methods. It is a simple method as it requires time only. You may use a trick. Create a row set with accounts to import and a form that uses this row set. In this case, you may import data for all periods and any entity and category at once. Also, you may create an export form in the source workbook and paste data into existing forms. 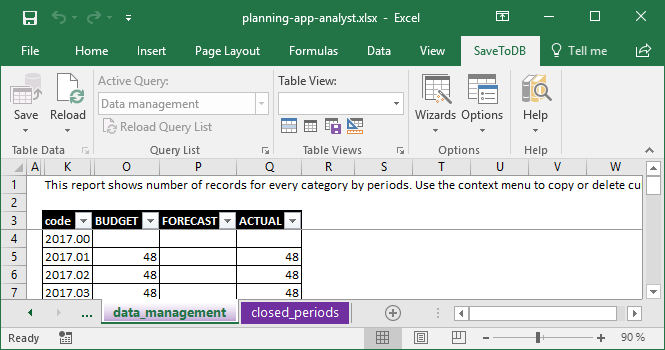 Note that you have to open the periods for changes to insert data. You may use the dbo25.usp_import_fact procedure to import data easily. You may export such commands from your accounting system and import using the sqlcmd utility. Note that the procedure accepts member codes as parameters. You may contact us to discuss other methods. Periodically, we need to create a copy of the current data. For example, we may fill the forecast data with actual data for past months and with budget data for future ones. Or, we may create several budget and forecast versions to make a decision about right numbers. For example, we may use these operations to prepare forecast data for this case. In the previous steps, we have created dimension members, configured forms and permissions, imported data. Now we may distribute the workbooks to our business users. We may send or publish a ready-to-use workbook. We may send an email with database connection credentials. In any case, the application uses the configuration stored in a database. So, both ways have the same features. Moreover, you may change settings later. Business users just update data and configuration. So, you distribute workbooks once. Note that your users must have the SaveToDB Enterprise 7.13 or higher installed. 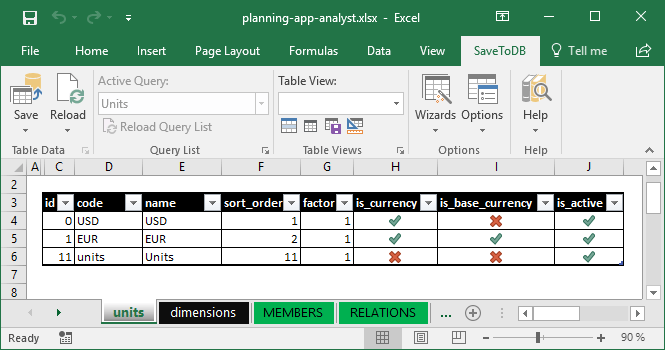 You may create a workbook for business users, create worksheets, and connect to tables. You may leave parameters empty. So, users will not see sensitive data. When a user opens the workbook, he or she must click Reload, Reload Data and Configuration. This action updates parameter values actual for the user. Then, a user selects parameter values and get the form with actual data, and may input data. When you create a new form, you may notify your users. They just click Reload Query List and get new forms. Usually, you create workbooks using your credentials. 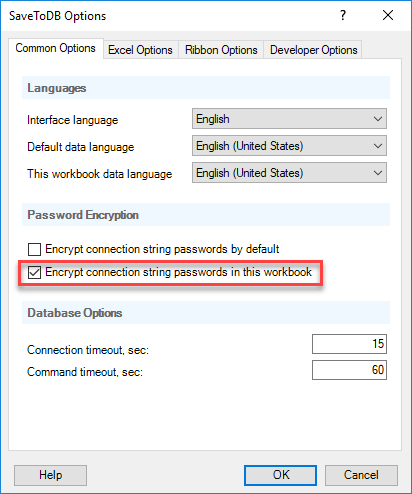 If you use the Windows authentication, you may send the workbook as is. When a user reloads data, the application connects with user&apos;s credentials, not yours. If you use the SQL Server authentication, you must protect your password. You may clear it. This is a standard Excel feature. In this case, Excel prompts a user for a password, and the user uses his login and password. However, you may use the SaveToDB add-in feature designed for this case specially. 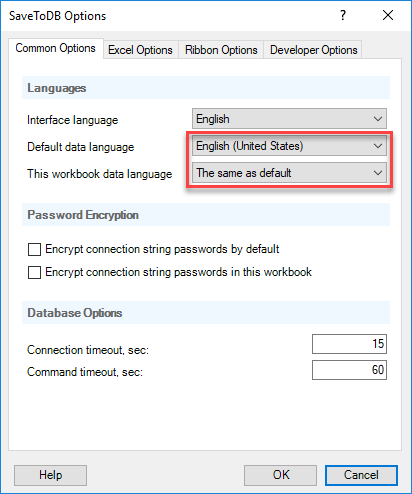 In this case, the SaveToDB add-in encrypts passwords using Windows encryption features, and no one can see or use your passwords. The planning application loads application settings from a database. This is a SaveToDB add-in feature. So, you may send to your users connect credentials shown below, and they may connect themselves. Below is a complete instruction. You may send a link to the online version also. Users do this operation once. They may save a workbook and use it further. We have configured the planning application. Our users may work in Microsoft Excel and online. We have made these steps in Microsoft Excel. And you may repeat these steps for your case. You may have great results and satisfied users spending less money and time. I hope to see you as our valuable customers. We need more than seven dimensions. How to add a dimension? Adding a dimension requires changes to the application database. See a developer guide for this. We need change or add features. How to do this? The application has open source codes. So, database developers may do this. Moreover, you may add a lot of features just configuring the SaveToDB add-in. Please do not hesitate to ask us about your demands. We have a lot of accounts. Will your application work fast? The application uses standard joins with linear relations to calculate aggregates. So, it should work fast. We have a lot of business users. Will your application work fast? Business users execute stored procedures to select data on demand and to update the source cube data on cell changes within Excel. These operations are short. Microsoft SQL Server works with thousands of users. The application should work fast. Can business users work offline? Yes. See Offline User Forms. Can we use Azure Active Directory integrated authentication? Can you port your application to MySQL or PostgreSQL? This is possible. However, we do not have such plans. Note you may use Microsoft SQL Server Express for free. Can we operate with prices and amounts? Yes. Just use the Average calculation type for such accounts. Can we operate with the product of prices and amounts? In the current version, no. The application uses the linear model to calculate aggregates. 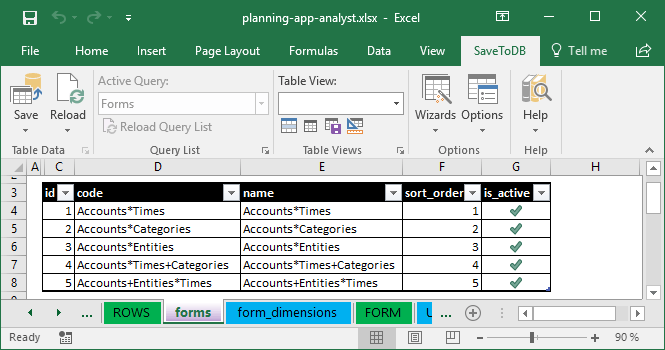 However, you may add formula lines below the forms in Excel and just copy results into forms. Can we operate with conditional formulas like IF THEN ELSE? To calculate taxes, for example. Just set the VAT account as a parent and set the factor value as the tax rate in the usp_members form. 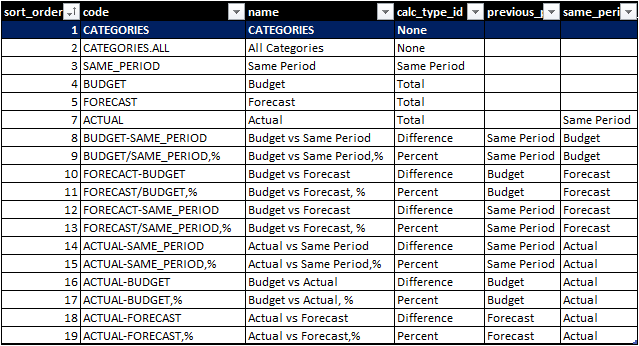 How to use different calculation models for budgets and actuals? For example, to calculate VAT. We need to have the same editable account in several forms. How to do this? Split the account into multiple accounts for different forms and set the master account as a parent. 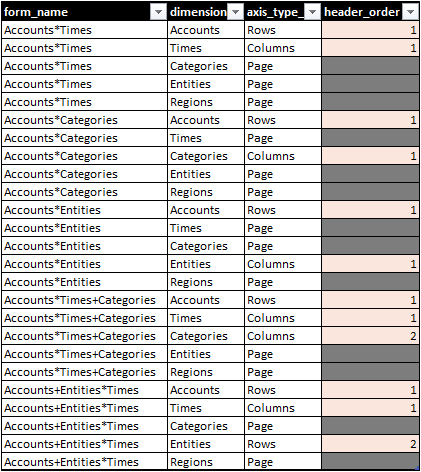 Create different row sets for different forms and link the rows to a single underlying account. A business user does not see the required form in the Query List. How to fix this? First of all, click the Reload Query List button at the ribbon. 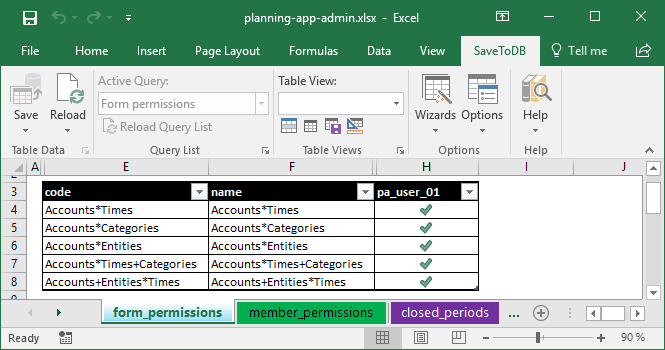 If the required form is absent, set the permission to execute the form in the usp_form_permissions form (in the planning-app-admin.xlsx workbook) and then reload the query list. 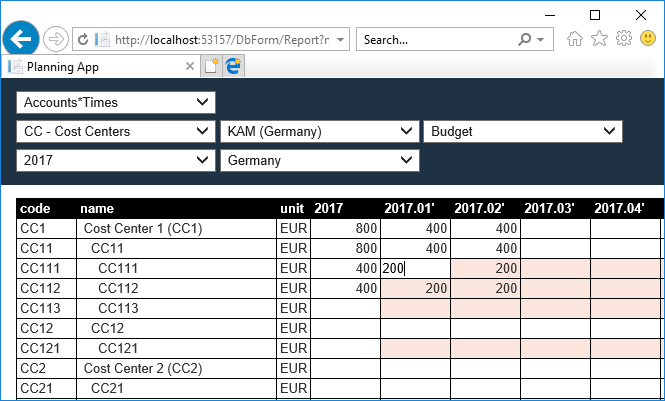 A business user does not see the required rows in a form. How to fix this? 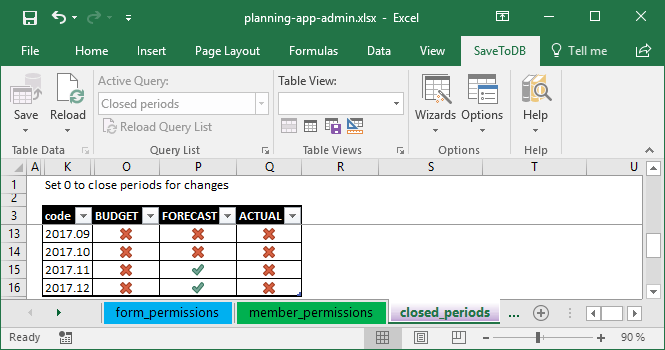 Check and change permissions in the usp_member_permissions form (in the planning-app-admin.xlsx workbook). Sales managers must have cost accounts from production in the same form. How to do this? In this case, sales managers may see data from production. 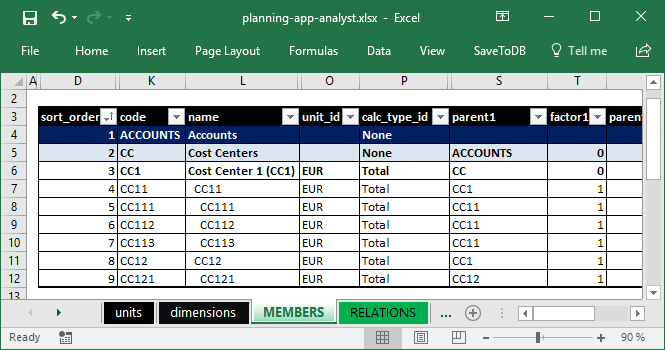 Also, place the Accounts and Entities dimensions in the row axis of the forms. 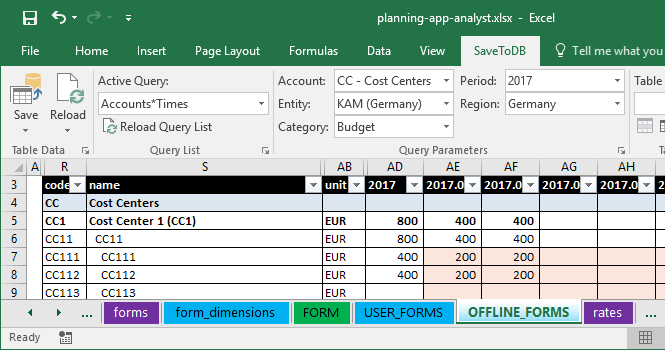 Otherwise, if the Entities dimension is on the page axis, the user can work with the sales or production data separately, but not in the same screen form. How to change form formatting for all users? 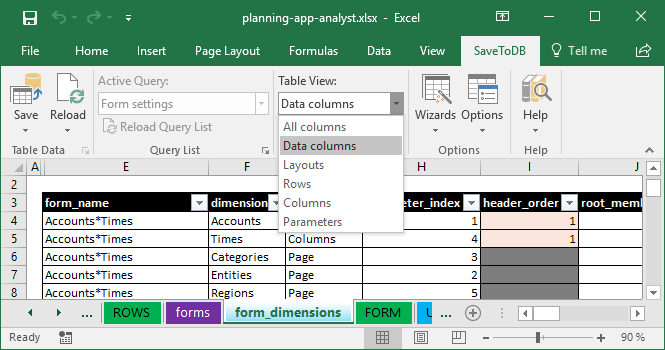 You may change the default form formatting in Excel. is_editable, decimal_places, is_percent, row_color, row_bold, and row_indent. 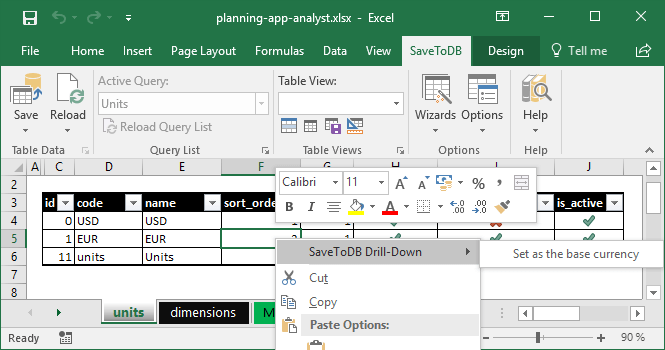 To save formats to a database, use SaveToDB Table Format Wizard. Users may run the same wizard and load new formats from a database. You may download the planning app at https://www.savetodb.com/download.htm. The application also requires SaveToDB Enterprise 7.13 or higher. You may download the add-in here too. The folder contains application workbooks, this e-book, and folders with SQL scripts. 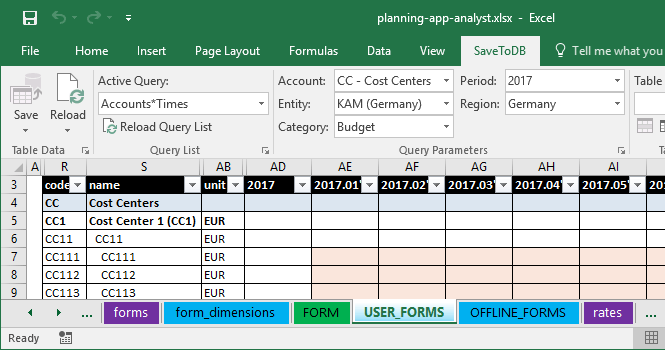 Create a database like PlanningApp. Open and execute (F5) the savetodb-framework-install-en.sql script. Open and execute (F5) the application-install.sql script. 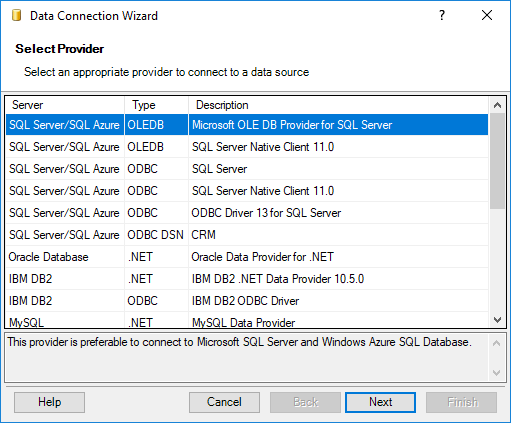 You may do these steps using SQL Server Management Studio (SSMS). 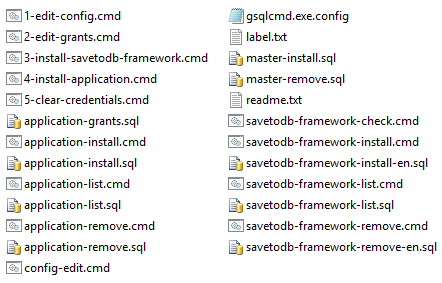 If you do not have SSMS installed, you may use gsqlcmd scripts discussed below. 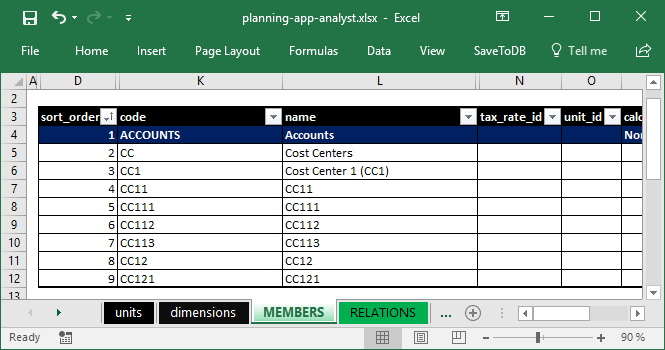 You may install the Cash Flow and Cost Centers examples using the Actions menu in the MEMBER worksheet in the planning-app-analyst.xlsx workbook. You may visit https://www.gsqlcmd.com, download and install the gsqlcmd utility. This free utility allows executing SQL scripts using connections configured in a visual mode. Click on the ... button and edit connection strings. Then click the Save button and close the editor. You may use gsqlcmd scripts to uninstall the application also. Just use application-remove.cmd instead of 4-install-application.cmd and savetodb-framework-remove.cmd instead of 3-install-savetodb-framework.cmd. If you install the application for test purposes, you may create test users used in the application workbooks. You have to open and execute master-logins-install.sql first against the master database. 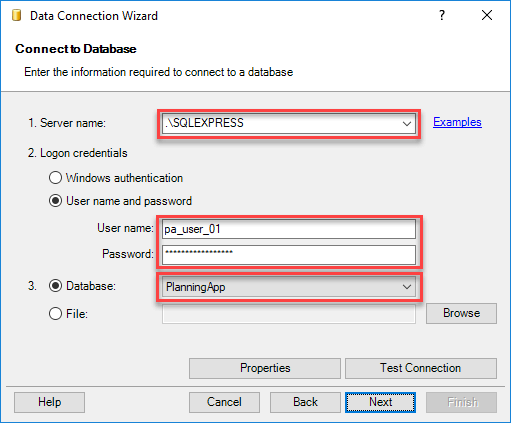 Then open and execute database-users-install.sql against the planning application database. The gsqlcmd scripts discussed above include these operations. You may use database-users-remove.sql and master-logins-remove.sql files to remove test users. Open and execute application-remove.sql first. Then open and execute savetodb-framework-remove-en.sql. If you do not have SQL Server Management Studio (SSMS) installed, you may use gsqlcmd scripts discussed above. 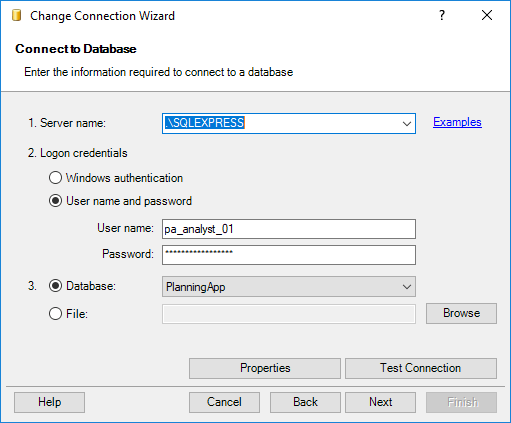 Workbooks use connections to a local SQL Server Express instance with the test usernames and passwords. 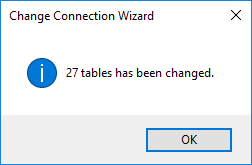 When you open a workbook for the first time, you have to change connections to your database. 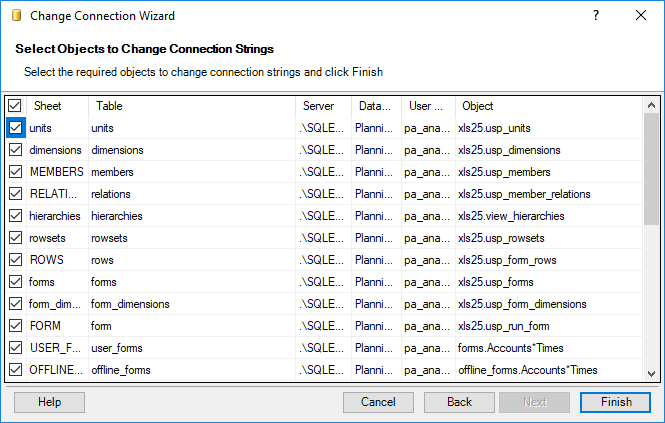 To change connections, run SaveToDB, Wizards, Change Connection Wizard. Change the server name and your user credentials. Click Next. In these steps, we have changed connections. Now you have to reload all data from your database using new credentials. That&apos;s all. You may save the workbook and continue work.